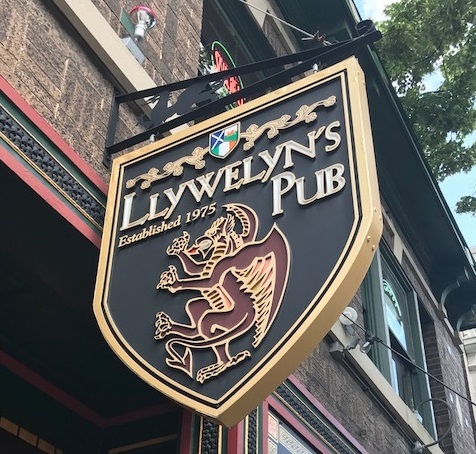 It is with genuine sadness that we said goodbye to the original Llywelyn’s Pub location in the CWE this weekend. On a personal level the Dressel’s have a deep and little known connection to Llywelyn’s. The founder of Dressel’s, Jon Dressel, was an important player in the opening of Llywelyn’s, and our two CWE pub stories began as one. Having recently visited his ancestral home in Wales, Jon brought the idea of opening a Welsh inspired saloon to his friend Jack Brangle. Together they brokered a deal to take over the old “Castlewood” bar and it was soon renovated into Saint Louis’s first Welsh Tavern. Jon’s interest in Wales was such that, just a year into opening the pub, he took a job in Wales and eventually sold his shares to partner Jack due to his absence from Saint Louis. The rest of the history is well documented but suffice to say that JD was an integral part of the conception of one of the coolest and beloved bars of its time. The original Llywelyn’s was a typical Saint Louis tavern in terms of its layout. A long bar with a shotgun kitchen located in the back. One cook, one bartender, and a couple of servers. Where it differed was its approach to food and the Welsh inspired décor. The original oil painting of Prince Llywelyn was painted by Patty Brangle and hung proudly next to the old entrance. I have a personal interest in the piece as my father was the model for the painting and the likeness to the 1970’s Jon Dressel is striking. If they’re ever willing to part with the picture it would certainly feel at home over the fireplace at Dressel’s. I drank my first cup of coffee at the bar when I was 10 years old. I remember some of the original staff and I certainly remember the day the first homemade potato chip was cut in the kitchen. I believe, although cannot verify, Llywelyn’s was the first Saint Louis establishment to produce the now ubiquitous house chip. At midnight on Saturdays the Anvil chorus would be played on the tape deck, beer mugs would crash, and much joy was had by my parents’ generation, the pioneering generation of a more modern Central West End. The same folks who opened and closed Gaslight Square and then moved it to Euclid were the two Herbie’s, the Drapers, the Brangle’s, and the Duffy’s. Long before the investors were circling, the West End was gritty, lively, and full of characters. At one time the McPherson corner was the equal draw to Maryland plaza including Balaban’s, Duff’s, The Europa, Goldstein’s Deli, Llywelyn’s, The Orphanage, Potpourri, Left Bank Books and a Jaguar dealership to name a few. With the doors of 4747 McPherson being locked for the last time as Llywelyn’s Pub on Sunday, Dressel’s is the last establishment left from a generation that made the CWE one of the city’s premier entertainment districts. Jon’s second pub is still a fixture in the neighborhood. So let’s raise a glass it stays that way (at least until some of the other spots have weathered a couple new coats of paint).